This year I had the pleasure of playing a few private courses and had a caddie on my bag. I was nervous at first but after a few holes it was fun. Yes, it was nice to have someone else provide valuable information, like when to layup or go for the hole. It was a treat to have someone rake the bunker and all the other small things they do to make your round enjoyable. What really added to the “fun” was the personalities and story telling of the caddies. And that made me want to know more about caddies. I have read two books and both are worth reading if you are an avid golf fan. The books are very different. The first book is “An American Caddie in St. Andrews” by Oliver Horovitz. The second book is “Loppers: A Caddie’s Twenty-Year Golf Odyssey” by John Dunn. If I had to recommend just one book, I would tell you to read “Loopers: A Caddie’s Twenty-Year Golf Odysey” because it takes you on a journey to so many famous courses: Augusta, Bandon Dunes, Shinnecock, and St. Andrews. I really enjoyed the variety of courses and Dunn’s description of the caddie’s life at each place he worked. Also, Dunn is living a nomads life and there is a underlying struggle he has with the idea that he should get a “real job” and the struggle with his father’s view of his job. As a woman, I was also surprised by some of the behavior of the caddies. The term “frat boys” is what comes to mind with some of the stories Dunn shares about his life with other caddies. The book is great at balancing the romantic view we all of have of the caddie life with the realities of being a caddie, and the personality you must have to live the life travailing from course to course. The book by Oliver Horovitz is also a great read but as the front cover of the book reveals the story is about a young man “Growing Up, Girls, and Looping on the Old Course.” The best part of the book is the “secrets” revealed about the caddies of St. Andrews. The book takes place in two places — at Harvard (where Horovitz is a student) and St. Andrews. The chapters at St. Andrews are what I enjoyed most (no surprise, I’m sure). Horovitz also shares his personal story including the time he shares with his Uncle Ken, who lives in the town of St. Andrews. It was a very lovely back story, but I was reading the book to get a peek at the job of a St. Andrews caddie and the old course. I must admit one of my favorite chapters was about Horovitz caddying for Lydia Hall in a qualifying round of the Ricoh Women’s British Open. Both books reveal that there is a pecking order in the caddie shack and it takes a lot of hard work to gain the respect of fellow Loopers. However, the big difference between the books is that Oliver Horovitz is a student at Harvard and not living the “vagabond” life John Dunn experienced as a caddie. In some ways, Horovitz appears to be living the life of a privilege student just caddying for his summer job. However, Horovitz, like Dunn, earns the respect of the seasoned caddies (no small feat at St. Andrews) and takes the job seriously. Horovitz also has a wonderful understanding of the “once in a lifetime experience” playing St. Andrews is for most golfers and wants to make the round the best it can be for the golfer. Both men have a passion for the sport we all love and reveal that if you are lucky you get to combine your passion with your job. Read both books and you will be exposed to very different roads taken in a very unique career. Bogey Ballton’s Night Before Christmas is a clever rendition of the classic “A Visit from Saint Nicholas” or “Twas the Night Before Christmas” by Clement Clarke Moore. This is the second book review I have done of Bogey Ballton and it was because of the first review that I wanted to buy this Christmas book. As with the first book, “Bogey Tees Off,” the illustrations are whimsical and fun; and a life lesson is part of the story. I was really curious about how they would tell an iconic Christmas story with a golf theme and I was pleasantly surprised. If you are a Christmas snob you may not like a book that takes on a classic but I loved the fun and quirky way the story portrays Santa and reindeer. Again, when you give the gift of a Bogey Ballton book you are not just giving a great gift but you are also giving to charity. So, I encourage everyone to get Bogey’s Christmas book. 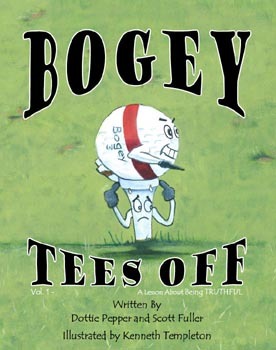 Also, if you have not purchased “Bogey Tees Off” then buy both books and double the fun of reading with your child. Or if you want to give the gift of reading to many children then do as I did and donate Bogey Ballton books to your local library. Disclaimer: I have no affiliation with the Bogey Ballton team. I’m just a golf fan who likes Bogey Ballton books. Bogey Tees Off is a wonderful golf book for any child. If you are like me, and do not have children of your own, I encourage you to buy the book and donate it to your local library. I did and here is my story on how I came to love Bogey Ballton, a range ball who wants to play on tour. Dottie Pepper, co-author of “Bogey Tees Off,” was giving an interview and her joy for her book was infectious. Pepper spoke about “the lesson about being truthful” as a theme, the glossary of golf terms, and the autograph signature space at the back of the book. She also spoke about her co-author and creator of Bogey Ballton, Scott Fuller and the wonderful illustrations by Kenneth Templeton. Finally, I was impressed that a percentage of the book sales went to charities; including junior golf initiatives. I had a fleeting thought to buy the book but felt it would be silly for me to buy the book since I could not think of any young child to give it to as a gift. After the interview, I tweeted Dottie Pepper to give her kudos for the interview. The Tweet from Dottie Pepper was enough encouragement for me to do a search online for the book. You can buy it at the major online book sites but I wanted to learn a bit more about the book so I went to the official website. I decided to buy the hardcover book motivated by the fact I was supporting junior golf. The book arrived and I took a few minutes to read it. To my surprise, I really enjoyed the story. The true sign of a good book from me is I want to know what happens next and that’s how I felt after reading “Bogey Tees Off.” So I am hooked and will be watching for the release of volume 2 of the Bogey Ballton series. I really wish my nieces were younger so I could give the book to them. However, I refuse to be one of those Aunts that gives a gift that is based on my likes and not their interests. My nieces are at the stage in life where music, movies, clothes, and boys are more interesting than golf — which is just fine with me. Later that day I was online reserving a book from my library and it hit me. Maybe the local library takes book donations. I searched the online book catalog for “Bogey Tees Off” and it was not listed. So I took the book to my library, walked into the children’s room (which I had never been in), and spoke to the children’s librarian. The librarian was a bit skeptical because she looked in her “purchasing system” and did not see the book. I explained that Dottie Pepper was a famous golfer and this was her first children’s book, etc. The librarian said she would need to read the book and get back to me as to whether or not she would be able to add it to the collection. At first I was surprised (maybe a tad offended) that my book donation was in question. But then I realized she had a responsibility to provide quality books to the children of our town. After a number of weeks I was beginning to wonder if I would ever hear from the Librarian. Finally, the call came and the news was wonderful. The librarian said “This is a book I definitely want to add to the children’s collection. Thank you for thinking of us.” I felt so happy that she liked the book and it was now going to be available for kids in my town to read. The librarian also reminded me that my town is a member of a network that includes a consortium of 42 libraries and anyone can reserve the book online. This is a simple story about one small act to donate a book to a library but it also is one small step in helping expose a new generation to a great sport. You never know who you will impact with a “small act of kindness” but it feels great to do something, even if it seems minor in the scoop of bigger charitable activities you do in life. Take action and donate “Bogey Tees Off” to your local library. Who knows, maybe some child that reads the book you donated will decide to play golf and even go “on tour” one day.